Whether you're operating a crane, a bulldozer, or a forklift or you're monitoring the construction site, two way radios can help you do your job more safely and more efficiently. Communication on the work site is a must when heavy materials and equipment and loud machinery are all over the place. Two way radios are specifically designed to improve worker safety and increase the quality of communication for construction sites. TwoWayRadiosFor.com offers a full line of two way radios that meet the strict requirements of the rugged work environment that construction workers face every day. Let us help you with your communication and safety needs! Our Construction Combo Pack is perfect for construction sites looking to improve communication, workplace safety, and worker efficiency! 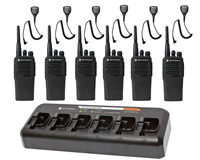 This radio package includes 6 Motorola RDU4100 4-watt 10-channel two way radios, 6 remote speaker microphones to pair with your radios, and a bank charger that will charge all 6 of your radios at one time. These radios will cover a large jobsite and are extremely durable with outstanding audio quality. We also offer the less powerful RMU2040 2-watt walkie talkie for smaller construction sites. You can pair your Motorola two way radios with the HKLN4606 remote speaker mic that is included in the Construction Radio Bundle or you can use them with the HKLN4604 Swivel Earpiece with push-to-talk communication. You can also use the radios without any audio accessories if you prefer.